The story of Maximus Meridius, from the hit movie the Gladiator, can serve as inspiration to online casino punters everywhere. He started out on top of the world, as the General and confidant to the Roman Emperor. Unfortunately, hard times hit, he lost his position and fell pretty hard as he was sold into slavery. Miraculously, he once again rose to the top as a Gladiator and regained his honored position. This up, down and back up again roller coaster ride is the perfect theme for an online slot game. One minute the minute reels are in your favour, with 5 symbols in a row and a huge payout, and then you suffer through some bad spins. But, like the Gladiator, you too can rise back to the top. 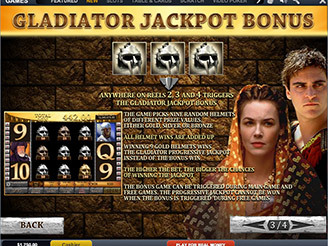 Gladiator Jackpot is nearly identical to the regular Gladiator online slot game at MansionCasino.com with one major upgrade – an exciting progressive jackpot round. There are two bonus features to look for in the Gladiator Jackpot online casino game, as they can help you win some serious money. The first one is activated by the Colosseum scatter symbol. When three land on a single spin you will go to the Colosseum bonus round. This is a free spin game that is preceded by a pick and click feature. Start out by choosing bricks from the famed marble columns of the colosseum. There are four rows, in the first row you will find out how many free spins you’ll get. The second row of columns will determine the multiplier, the third rows has the extra scatter symbols and the fourth row has the extra wild that will be on the reels for all the free spins. The Gladiators helmet is the wild symbol and when it lands on all three middle rows you will activate the Gladiator Jackpot feature. On the screen you will see 9 helmets, 3 gold, 3 silver, and 3 bronze. If you pick the right helmet you could win the ever-growing Gladiator Jackpot and be kindly remembered for all of eternity, just like the gladiator himself. The only reason to play Gladiator Jackpot instead of the original Gladiator game is to try and win the progressive jackpot, So, it doesn’t make sense to pay in Practice Mode, where the jackpot isn’t active. Open your account and start playing for real money today and we’ll start you off like a winner with a Welcome Bonus of up to $/€5,000. Use that money and try and make your meteoric rise from humble internet casino player to progressive jackpot winner today.